Humanity's in-line ‘Budget’ mode allows you to easily manage and stay within your budgets in real time asyou schedule. This has been highly requested as it is an extremely powerful feature that clearly shows when you are under budget or over budget in a daily, weekly or month view and with the 'Budget Report' you have a complete view or your budgeting and what to do about it. 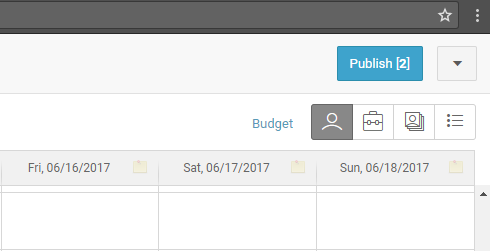 You will see the budget table at the bottom of the ShiftPlanning tab. In the ‘Week’ view, the ‘Budget’ window appears at the bottom of the page where you can see your set ‘Budget’ hour totals (clock icon) against your 'Actual' hours: how much you actually have on the Schedule for the week or for each day. You can budget the 'Hours' or can set a 'Cash' budget (Cash icon). You can see if you’re under or over 'Budget' for that period. If you're under budget, your actual amounts will be in green; and if you're over, they will be in red. Click ‘Pencil’ icon and you will be able to edit your set ‘Budget’ amount either for the week or day. Once finished, click the icon again. In the ‘Day’ view, it shows your 'Actual' hours or how many employees are scheduled by the hour and by cash amount and you can see whether you’re under or over staffed in those hours. To the left, you have your total daily 'Actual' hours scheduled over your set 'Budget' hours and cash amount. The 'Cost' is taking the 'Scheduled Hours' and adds up how much you are paying each staff member and calculates the correct total.